We have the feeling that you are on the brink of a big leap forward in the evolution of your consciousness, and we are focusing our attention on the way you are receiving the energies that are upon you. How we gauge your progress is by how much you are able to assimilate when you are given a large dose of high frequency energy, and we are very pleased by what we have seen so far. We see you opening up to receive the energies of the solstice, and in so doing, you are also opening yourselves up to more of what you have asked for. This means that energies that have been waiting for you to relax and receive have been entering your physical body, your cells, your chakras, and your DNA. We are seeing a transformation amongst many of you, and those of you who are experiencing the transformation can feel it. You have sensed your own readiness, and now that you are assimilating that which you have been given, there is a small waiting period before you will actually see the physical results. You are chartering new territory here, and it is wonderful to witness the expansion of the human collective consciousness. Those of you who are able as individuals to take what you have been given and use it are responsible for the expansion of the collective consciousness, and you need to give yourselves credit because no one else is going to. And also, you deserve it. You have earned the credit you are getting from us, and you have earned the credit that you need to give to yourselves. There is much more ahead of you, but now is a time to celebrate. Now is a time to luxuriate in the energies that you have been willing and able to receive. Now is a time to wait for inspiration, because it’s coming. 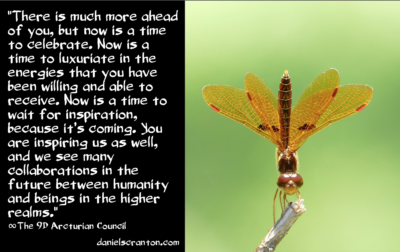 You are inspiring us as well, and we see many collaborations in the future between humanity and beings in the higher realms.